On Monday the United States Supreme Court stood up for women’s health and rights by striking down parts of a Texas law that imposes restrictions on abortion providers. 83-year-old Supreme Court Justice Ruth Bader Ginsburg was one of the five members who ruled in favour of the decision. 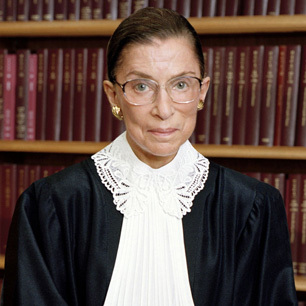 Ginsburg is celebrated by popular feminists in the US for her „badass“ reputation for supporting women’s rights in an arena dominated by old, white men. This has earned her the nickname „the Notorious R.B.G.“ (a nod to the rapper Notorious B.I.G. ), along with a host of supportive memes that make use of law-speak to celebrate the female justice icon. Ginsburg did not mince words on Monday, writing in her opinion that is was not rational that this law could protect women. „It is beyond rational belief that H.B. 2 could genuinely protect the health of women, and certain that the law ‚would simply make it more difficult for them to obtain abortions‘,“ she wrote. She also pointed out the likelihood of women resorting to unsafe procedures when they are unable to have a safe abortion. HB2 would have caused the majority of Texas‘ abortion clinics to close, leaving some women in rural areas hundreds of miles away from a clinic. „When a State severely limits access to safe and legal procedures, women in desperate circumstances may resort to unlicensed rogue practitioners, faute de mieux, at great risk to their health and safety,“ she wrote. An unlikely pop cultural hero perhaps, but one making the decisions that affect millions of lives.